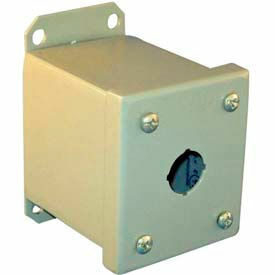 Springer Controls 22mm Enclosures Mount Standard 22mm Pushbuttons, Pilot Lights And Switches. Springer Controls Enclosures 22mm Enclosures are made with polycarbonate or painted metal shell for long lasting durability. Enclosures offer increased protection from dust and contaminants. Base mounted contacts type (no operators). 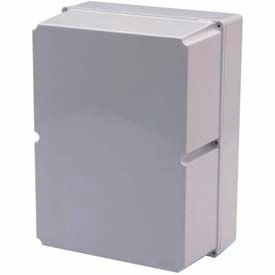 With a compatible operator installed enclosures offer IP 66 protection in dirty or wet environments. NEMA 1, 3, 3R, 4, 4X, 12, 13 certified. Types are 1, 2, 3, 4 or 6 hole. ACI Enclosures Are Used For Commercial And Industrial Contractors, Electricians And More. ACI Enclosures are made of solid polycarbonite long lasting durability and reliability. Protects electric and electric control conponents. Light Gray. Environmental Rating: IP65, Type 4X/4/12/3R/1. Operating Temperature: - 40° to + 260° F. UL listed. Available in nearly 50 dimensions to suit specific requirements: 2.95" to 8.66"Width, 2.56" to 5.9"Depth and 4.3" to 11.81"Height.